protection when working near the battery: Working without eye protection is dangerous. Battery fl uid contains SULPHURIC ACID which could cause blindness if splashed into your eyes. Also, hydrogen gas produced during normal battery operation, could ignite and cause the battery to explode. protective gloves to prevent contact with battery fl uid: Spilled battery fl uid is dangerous. Battery fl uid contains SULPHURIC ACID which could cause serious injuries if it gets in eyes, or on the skin or clothing. If this happens, immediately fl ush your eyes with water for 15 minutes or wash your skin thoroughly and get medical attention. out of the reach of children: Allowing children to play near batteries is dangerous. Battery fl uid could cause serious injuries if it gets in the eyes or on the skin.
) terminal to contact the vehicle body: Flames and sparks near open battery cells are dangerous. Hydrogen gas, produced during normal battery operation, could ignite and cause the battery to explode. An exploding battery can cause serious burns and injuries. Keep all fl ames including cigarettes and sparks away from open battery cells. 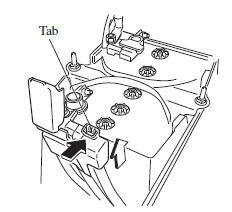 Before performing battery maintenance, remove the battery cover by pressing the tab. If the vehicle will not be used for an extended time, disconnect the battery leads and charge the battery every six weeks. A low level of electrolyte fl uid will cause the battery to discharge quickly. Inspect the electrolyte level at least once a week. 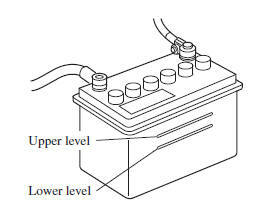 If it is low, remove the caps and add enough distilled water to bring the level between the upper and lower level (illustration). Examine the specifi c gravity of the electrolyte with a hydrometer, especially during cold weather. If it is low, recharge the battery. To disconnect the battery, remove the negative lead fi rst. Install it last when connecting the battery. (With i-stop system) Do not quick-charge the battery. Contact an Authorised Mazda Dealer for a battery replacement purchase.